The once Headmaster Senlin is now firmly become Captain Tom Mudd of the Stone Cloud – an airship liberated from its previous owner and now in the hands of Senlin’s very capable and most definitely diverse crew. They have become fairly successful pirates working the airstreams of the infamous Tower of Babel. Captain Billy Lee, a drunkard on the verge of mutiny by his own crew, will not stand up long against Captain Mudd, the amazon and the woman with a mechanical arm. Sometimes he thinks of his old life, and his wife, but thus far Senlin’s attempts to get back into the tower and find her have been unsuccessful. His wife was sold, he now understands, to a man of means via a wifemonger. Perhaps she is happy in her new life. Perhaps she would be less than impressed at having a wanted criminal for a husband. Nonetheless, if she is in the tower, that is where they must head. If only they could find their way back in. 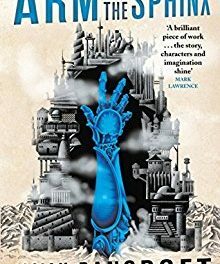 Like the first of the The Books of Babel series before it, Arm of the Sphinx continues to spoil and delight the reader with more of Senlin’s desperate and ever more bizarre antics and confrontations in the search for his lost wife. Pleasingly, the amazon, Edith and some of the other supporting characters from the first book are given more page time and back story, granting welcome opportunities to get to understand them better as well as the ability to look at Senlin from a distance and see him as they do – in his various moments for better and for worse. Still excitingly different to anything else in the current ‘to read’ pile, this follow up continues to deliver. 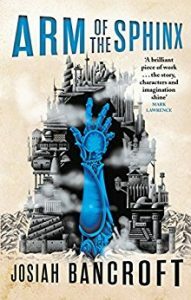 The ‘Everyman’s Guide’ of the first book has given way to other sources which further elaborate on the tower and society, and also Senlin’s own incautious confessions in the ship’s journal, all of which add to the increasing reality of Bancroft’s world and the tensions amongst our hero and his companions. In short, if there is more to come, it will be welcomed with open arms and ready eyes.